China's Foreign Minister Wang Yi attends a news conference during the ongoing National People's Congress (NPC), China's parliamentary body, in Beijing, China, March 8, 2018. China’s Foreign Minister Wang Yi has urged North Korea and the United States to hold talks as soon as possible, calling on all parties to take steps to move the situation forward and, as he put it, fight for peace. During talks earlier this week, South Korean officials said North Korea had offered to hold talks with the United States about normalizing ties and denuclearization. 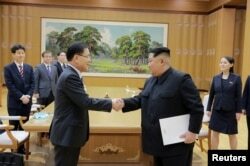 FILE - North Korean leader Kim Jong Un shakes hands with Chung Eui-yong, who led a special delegation of South Korea's president, in this photo released by North Korea's Korean Central News Agency, March 6, 2018. Many are still undecided about what to make of the development, which some analysts note could be a diplomatic breakthrough, an attempt to weaken sanctions or both. In the past, North Korea has broken agreements to end its nuclear program in exchange for security guarantees and economic assistance. Addressing reporters on the sidelines of China’s annual top-level political meetings in Beijing, Wang Yi said while the issue has taken an important step in the right direction and there is a light at the end of the tunnel, the road ahead would not be smooth. FILE - South Korean President Moon Jae-in delivers a speech during a ceremony celebrating the 99th anniversary of the March First Independence Movement against Japanese colonial rule, at Seodaemun Prison History Hall in Seoul, South Korea, March 1, 2018. 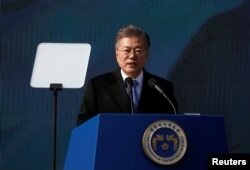 South Korea’s President Moon Jae-in echoed similar concerns on Thursday when he said that many “critical moments” still lie ahead to end the nuclear crisis. 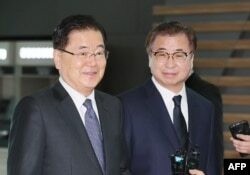 Moon made his comments as two senior officials from Seoul departed for Washington to brief officials there on the outcome of their recent visit to North Korea. South Korea's national security advisor Chung Eui-yong (L) and spy chief Suh Hoon (R) arrive at Incheon airport, west of Seoul, on March 8, 2018 to leave for Washington. Late next month, President Moon and North Korea’s Kim Jong Un are scheduled to meet at a border village for talks. It would be the third such meeting between the two sides since their 1945 division. Seoul has said that North Korea is willing to suspend nuclear and missile tests during such talks, but how South Korea and the United States respond is less clear. The toughest regime of sanctions on North Korea to date, which has had an effect on both Pyongyang and its closet allies, China and Russia, are expected to continue, as are military exercises conducted by Seoul and Washington. North Korea views such exercises as a threat and wants them to stop. And it wants the complete withdrawal of U.S. troops in South Korea. 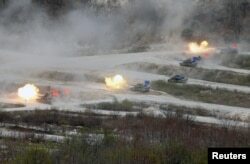 FILE - South Korean Army K1A1 and U.S. Army M1A2 tanks fire live rounds during a U.S.-South Korea joint live-fire military exercise, at a training field, near the demilitarized zone, separating the two Koreas in Pocheon, South Korea April 21, 2017. When Wang Yi was asked whether he agreed that the complete withdrawal of troops was the only way to ensure peace on the peninsula, he did not directly answer the question. He did argue that China’s advocacy of a freeze for freeze (nuclear and missile tests in the North and military exercises in the South) had contributed to the current thaw. During the winter games, North Korea did not conduct any nuclear tests and the United States suspended its exercises, he said. “This proves that China’s proposal that suspension for suspension was the right prescription for the problem and created basic conditions for the improvement of inter-Korean relations,” Wang said. Wang did not mention the impact sanctions were having. For now, however, it seems that military exercises between South Korea and the United States could continue. A spokeswoman for South Korea’s Defense Ministry has said an announcement for the schedule of joint drills will come after the Pyeonchang Paralympics finish on March 18. 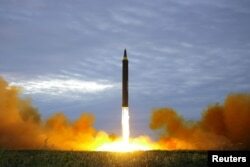 Zhao Tong, a fellow at the Carnegie-Tsinghua Center for Global Policy, said that it was perhaps neither sanctions or a freeze that had pushed North Korea to reach out to Seoul or express its willingness to talk with Washington, but its completion of three intercontinental ballistic missile tests last year. FILE - A missile is launched during a long and medium-range ballistic rocket launch drill in this undated photo released by North Korea's Korean Central News Agency (KCNA) in Pyongyang, Aug. 30, 2017. “North Korea has already completed the first step of its nuclear strategy, which is to first establish its basic nuclear deterrent capability,” Zhao said. After that, he adds, North Korea quickly began reaching out and moved to counter the negative impact of its tests.